What are the aesthetics of sustainable design? New ways are needed of appreciating ecologically valid design that can incorporate the artistic dimensions with the material effects. This presentation will explore the application of ecological design in the Performing Arts as it creates new sensibilities, new dramaturgies and new forms of experience throughout a range of theatre productions. These aesthetics expand on existing design critiques and offer ways to consider the relations between the content of what is performed to the ecological and artistic dimensions of stage design. 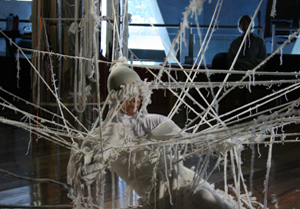 The presentation included a live and interactive showing of Tanja Beer’s “STRUNG”, an eco-scenographic investigation that merges the boundaries between performer and designer, installation and costume, site and material.